Aside from travelling to Wales to see King Crimson in concert, I spent most of this month obsessively writing more songs for Fifty/Ninety. The rest of my time was spent restoring my office PC to Windows 7 after deciding that the free upgrade to Windows 10 really wasn't worth it. And it isn't, believe me. Now that the pressure's off, I've been taking a little more time over things - I spent yesterday evening and a couple of hours this morning on this one, and when I'd finished I'd used 22 tracks on the multitracker and even more within Ableton. I haven't done that for a very long time. There are ten vocal tracks in total - four vocals and six choir - and four guitars, two acoustic and two electric. Judging by the comments it's received over at Fifty/Ninety, it was time well spent. I do need to tidy up the bundle of cables and pedals strewn across the floor, though. The place looks a mess and I'm sure health and safety would have something to say about the place. That's this evening's task. I still have plenty of other stuff to record and mix - there are two more Exquisite Corpses with sections from me in the pipeline and some more collaborations to work on, but I want to get to October 1st having written at least fifty solo pieces this summer. That means I have to write and record another four pieces of music by a week tomorrow. At the moment I think I should be able to manage that without too many problems. Reverberation is a subject that has always fascinated me. You might gather as much from the fact that today is not the first time the blog has tackled the subject. I much prefer a "wet" recording to a "dry"one and the longer the reverberation tail, the better. I made sure that the first big guitar amp I bought had a spring reverb in it (I've still got it, too). With the advent of digital technology the ability to add reverb to my recordings has got easier and easier; from the cheesy little Yamaha R100 I used in the 90s that's now languishing on a shelf somewhere to the VST plugins for DAWs that I use these days, I threw all the reverb I could at my stuff. The track above uses one of the effects presets in Ableton Live, called "sixty second reverb" because the decay time is a mind-bending (and, I believe, physically impossible) sixty seconds. Despite how ridiculous it is, I find I use it an awful lot, usually at very low levels on an aux track to give a bit of just-discernible mistiness around my vocals. Max for Live has a very interesting convolution reverb, which among other things lets you apply a prerecorded sample of the reverberation of a real space to your music recordings. You can get loads of impulse files on the web for free; some, like the grain silo in Abernyte, provide gorgeous, lush reverberation tails. What's not to like? 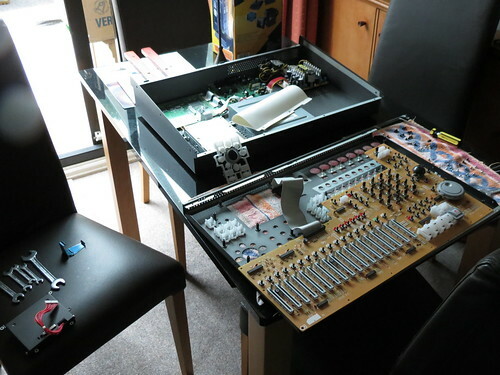 After disassembling it I applied Servisol to the faders and other moving parts, buffed the contacts on the motherboard connectors, cleaned out some gunk from the fader tracks, and then put everything back together again. I must admit I was holding my breath when I powered it up again, but it's working as good as new. And Servisol is great - no home studio should be without some. I've just been perusing my new favourite website again. Gilmourish is devoted to the guitar sound achieved by David Jon Gilmour, CBE, and it is incredibly comprehensive. There's a great temptation to just go and buy ALL THE PEDALS mentioned, but I will stick with what I've got for now, I think. I'm not doing too badly when it comes to tone. After last month's grumble about Windows 10 I decided to stick with it - until I started reading stories like this about the creepy approach Microsoft are taking with their attitude to privacy, and until the sound card started acting up because the settings I'd selected and the drivers that I installed were replaced by ones that Microsoft thought I ought to be using. So at the end of August, before my option to do so disappeared, I clicked on the "revert" button on this machine to go back to Windows 7. Everything seemed to be going according to plan, until it came time to reboot into the machine's previous OS. Nothing doing. The machine wouldn't boot. After much swearing I dug out my old OS CD and selected "Windows Repair." Still nothing doing. The "restore" option had thoroughly trashed the operating system. I wasn't going to reformat the C: drive and lose whatever was left of my files, so I did what I've been meaning to do for the last year or so, and installed a solid state drive (SSD) in the machine, installed the OS on that, and then began rebuilding everything from my original install disks for things, together with a selection of backup disks and drives. I noticed that the "restore" process in Windows 10 had taken quite a few of my documents directories and, while it had kept the directory structure intact when I went to look for the files that should have been in them, they'd all been removed. Thanks a lot, Microsoft. A week later, and I've just finished the process of restoring everything. It's not been simple, and I've lost more than a few files which I thought I'd backed up, but hadn't. Thankfully my photos, pictures, music and email archives are all still complete. But it's left me with an extremely jaundiced view of Microsoft. I haven't reinstalled my copy of Office - instead, I've switched over completely to LibreOffice (I've installed the just-released version 5). I was already using Thunderbird as my email client, so I won't miss anything that Outlook might offer me. I haven't used Internet Explorer for years, so I'm sure I can make do without Microsoft Edge, especially after hearing how slow it can be. On the plus side, I've got the proper version of Spider Solitaire back. Best of all, running the OS off an SSD has made a tremendous difference to the PC's performance. A clean install of Windows always speeds things up, but even so, things happen a lot faster than they ever did before. Programs install in seconds. Some programs are now blindingly fast - to the point that I actually said "whoa!" on a couple of occasions. As a result, I guess I've come out of this ahead, but it wasn't a process I'd have gone through willingly. And when Windows 7 finally comes to the end of its life, I suspect I'll be moving over to Linux.